Looking for a family fun holiday by the beach…then discover why Crantock in North Cornwall may be the perfect holiday destination for you. Crantock is a charming village on the North Cornwall coastline, just five miles west from the popular Cornish resort of Newquay. It is a popular choice for families and for those who like to holiday with their dogs. Why so popular? 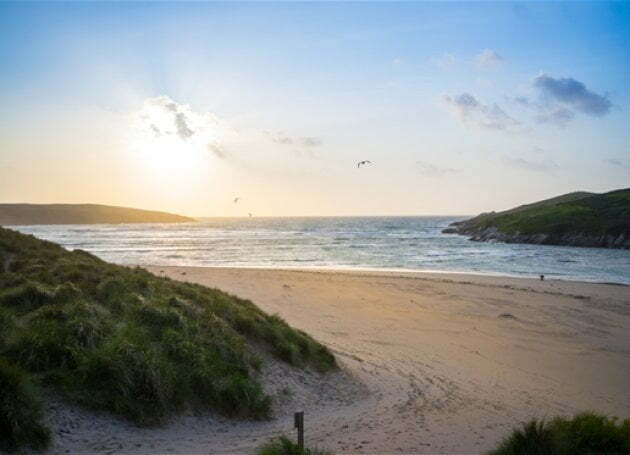 Well, the most obvious reason is that Crantock is home to a beautiful wide sandy beach, protected by large sand dunes, which boasts clean golden sands and good waves, so is considered by many to be one of the best beaches in the area. It also allows dogs all year round. Thus, it is a popular spot for families and surfers wishing to escape the crowds at nearby Newquay, with its clean golden sands ideal for those looking to build sandcastles or simply relax and bask in the sunshine. And, also popular for those looking to enjoy the beach with their dogs. For water enthusiasts, Crantock beach is a fantastic choice for surfing and water sports, where the waves are often much quieter than nearby Newquay and also suitable for all abilities. Crantock Bay Surf School provides the hire of wetsuits and boards, plus lessons. Much of Crantock is owned by The National Trust, where the headland is recognised as a Site of Special Interest due to the wild flowers and rare plants that grow there. At the south of the beach, there are high cliffs, and to the North is the mouth of The River Gannel, which acts as a natural border between Newquay and Crantock. During high season, there is a ferry which operates between Fern Pit and Crantock beach. Another popular beach nearby is ‘Porth Joke Beach’ or as it is more commonly known by the locals as “Polly Joke beach”, this can only be reached by foot, but well worth the trek. This stunning golden sand beach is situated in a deep cove between Crantock and Holywell. There are some excellent walks via the South West Coastal Path, which runs through the village, where you have the choice of walking along the headland, climbing over the sand dunes or strolling along the estuary. There is also a nice walk around the village, which roughly takes an hour and offers beautiful views over the river estuary and the stunning coastline. For refreshments and a bite to eat, Crantock boasts three excellent pubs – The Old Albion Inn and The Cornishman in the village itself and the Bowgie Inn on the headland. There is also a summer tea room – The Cosy Book Teagardens Café and Restaurant. In the village, there is also an art gallery, gift shop and a well-stocked village shop. St Carantoc’s church towers above the village and is home to the original village stocks last used in 1817. For activities and days out, the popular seaside resort of Newquay is only a short drive away, where there is a zoo, fun pools, the Blue Reef aquarium, the Newquay Golf Course, and horse riding at Newquay Riding stables. Also, within easy reach are the popular Cornish coastal resorts of Perranporth and Holywell. So, have we made you fall in love with the idea of Crantock? If we have, then you’ll be pleased to discover we have two excellent family friendly and dog friendly holiday homes, just a short walk to the beach and the village – Berwyn and Talland Croft. Both sleep 10 and are ideal for gathering family and friends (and even the dog) for a fun holiday by the beach. If you’d like to know more, view the properties below or contact the team at My Favourite Cottages on 01271 377 432. We’ll be happy to help answer any questions you may have about the individual properties and the local area.